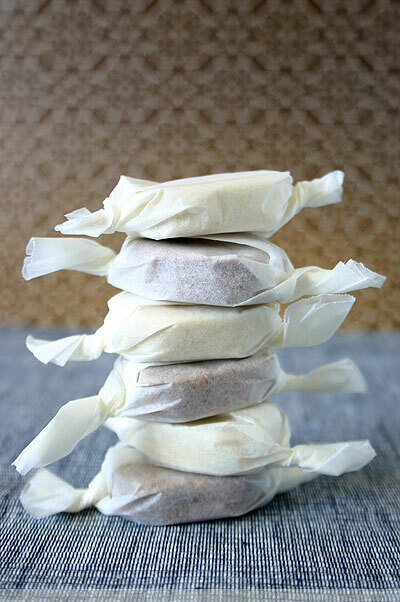 NOTE: I have received several comments about the Spanish origin of polvoron or namely polvorones. I do realise that this Filipino sweet was most definitely inherited from the Spaniards during their colonisation of the Philippines during the late 1500's, and I do apologise for not pointing this out earlier. However, this version of polvoron, I believe, is the Filipino permutation of the dessert after thousands of years of acquiring the recipe. Traditionally, Spanish polvorones is made with almonds and cinnamon, and does not contain any powdered milk like the Filipino version does. So although polvoron did originate from Spain, the Filipino version does differ markedly from it's Spanish original. Everyone loves a shortcut, taking the longer course or going through arduous and difficult procedures is usually left to sadists. Why do you think those "lose-10-pounds-in-two-weeks" exercise machines are so popular, and not to mention liposuction. Hey, when all this food-blogging weight finally catches up with me, I wouldn't say that lipo was out of the question. Inherently we all like the shorter path, easier to tread and faster to get through. Who wants to row a boat across a river when there is a perfectly reliable bridge? Sometimes a shortcut takes you to a place you never wanted to be at in the first place, sometimes it gets you in an argument you never wanted to have as you are tossing the street directory out the window, but enough about my life. Sometimes a shortcut can take you to a delicious destination in half the time, like a cake without the bake. Say what? Yes, a cake without the bake. 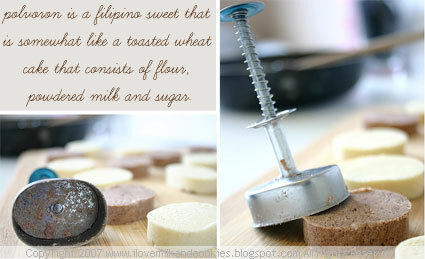 It's polvoron- a Filipino sweet that is somewhat like a toasted wheat cake that consists of flour, powdered milk, sugar and melted butter, and is compressed into a cake using a polvoron press. I used to eat these by the dozen as a child and I never imagined that I could make it myself. It always stood in my memories of childhood on some imaginary pedestal of foods that I could never possibly recreate. It seemed almost irreverent to reach into that corner of my childhood remembrance and rehash something that I have such a wistful affection for. Since I had never made this childhood dessert before, and always ever purchased it from the Filipino store, I doubted whether my creation could attain the same pleasure and gratification I got whenever I popped one of the store-bought ones in my mouth. Sweet and milky, the powdery cake slowly melts into a thick pool of sweet creamy goodness in your mouth. But I never realised how simple it was to make. And did I mention there is no baking involved? Traditionally polvoron is milk flavoured but sometimes nuts like cashews or peanuts are added. Also a popular addition is pinipig, which is immature glutinous rice that is pounded and added to the flour mixture and sometimes pandan (screwpine) or ube (purple yam) is also used to flavour polvoron. But as a child with such a juvenile palate, I could only savour the plain version of polvoron, I was much too fussy to eat anything green, or even more so purple. But this time I decided to make the original milk flavoured polvoron and a chocolate version as well. I know as a child I would have relished a chocolate flavoured polvoron, as most children probably would. I assume that this flavour would have caught on by now as I know that some places in the Philippines do sell a very post-modern cookies and cream version of polvoron. And if your imagination stretches far enough you could pretty much cnceive any flavour of polvoron- say green tea, lavender, coffee, hazelnut, which ever way you are inclined the polvoron can go that way. But today we are talking about sentimental food, so there can't be any meanderings into the bizarre and fanciful. It's all about the simple things that hark back to your youth. There's always something distinctly romantic about the food we've have in our youth and years later they somehow manage to mount the massive plinth for things we idealise and hold dear with starry-eyed affection. And this sweet, along with fairy bread and nutella sandwiches is definitely high on the list. As for the cake without the bake, well it might seem off-putting and unsavoury to be eating flour unbaked, but what is done first is that the flour is toasted in a skillet until it is slightly browned. Turn your eyes away for a moment and you might have yourself suffering from smoke inhalation, burnt flour does not smell good, so make sure you keep your eyes on the colour of the flour at all times. Just like caramelising sugar, it can go brown in the blink of an eye. It all comes together with a little melted butter and the powdery mixture is compressed in a polvoron mould that contains a small press that pushes out the shaped polvoron. 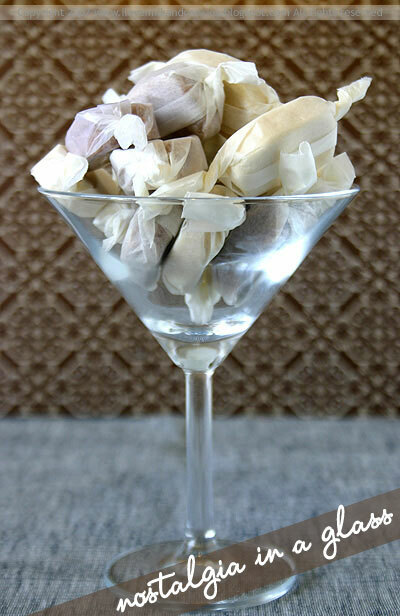 And to finish it off the polvoron is individually wrapped in paper like little powdered lollies. The verdict, well I couldn't help but be hard on myself. Could my own rendition of this hallowed childhood sweet be as good as it is in my memory? I don't know. To be honest when I tasted it I was pleasantly surprised at how similar it tasted to the store-bought variety, although for me it just wasn't the same. It was probably because my palate had been clouded by years and years of eating this stuff as a child, and frankly I don't think any version of mine could ever taste as good as it does in my imagination. But do try it for yourself and come to your own conclusion. But if you would like to see what other meals and recipes people are reminiscing about, head on over to the Skinny Gourmet. She is holding a food event focussing on food nostalgia. The round-up will be posted at the end of January. In a large skillet over low to medium heat, toast the flour until light brown. Add the melted butter and mix thoroughly in skillet. Transfer flour mixture to a plate and compact mixture in a polvoron press. 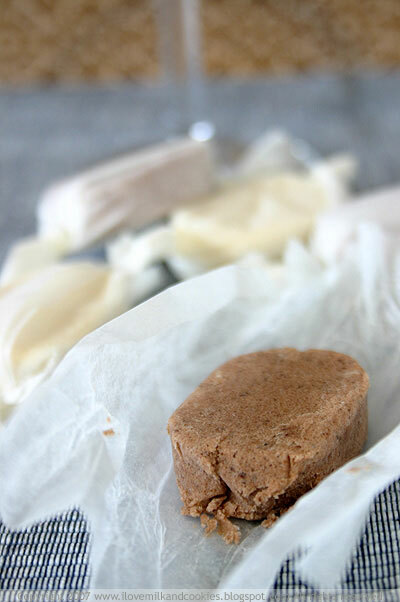 Place moulded polvoron onto a flat baking tray/cookie sheet and refrigerate for 1 hour. To wrap, cut tissue or soft wax paper into 12cm x 12cm squares. Beautiful little cakes! I can't remember if I've tried these before or not but now I want to go and find them. How wonderful that you were able to recreate a treat from your childhood. Wow, this was really interesting. I have never heard of these. Thanks for introducing me to something new! I absolutely loved the press! first time I see it...and congrats for the great GREAT photos. Interesting cake and lovely pictures! I think I would find it very tasty. I'm bookmarking the recipe just in case I have the urge to make them. My name is ana and I usually read your blog. I think it is very complete and I learn a lot of cooking. But, you have a mistake in your las post. Polvoron is a spanish tradicional sweet for Xmas, not from filipinas. Yours aro so pretty and looks fantastic. Wow. My good friend Mark of 'No Special Effects' sent me a Polvoron press last year and I've been meaning to use it. Thanks for showing me how, they ook great. That's interesting, I always thought polvorones were from Spain! I know these cakes as 'polvorones' meaning dust cakes from Spain. They are traditionally Spanish. You take one of these wrapped cakes and squeeze it in your hand so that its contents stick together, then you open up the wrapped mixture which you can pick up in your hand and eat. 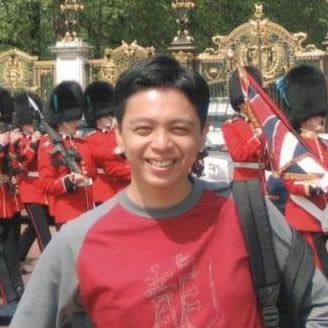 It's likely that they exist in the Philippines because it was once governed by Spain as it was part of its global empire. 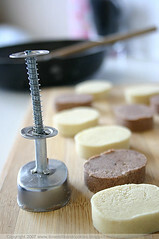 i would love to make polvoron myself...i'm sure it costs less than buying it! where did you get your press? Love the cute polvorons you made! A friend dropped several of those last Christmas, and I must have eated a dozen or so. Yeah, I think i know what you mean...my excitement as a child is not the same anymore decades later. My 'taste' in food differ now. But why did I indulge on those last Dec? Hi there, have just found your blog - your photos are absolutely gorgeous! Put mine to shame :) Those wee cakes look seriously good. Any idea how these may be done without a press? They look awfully fun to try but I doubt I could get my hands on that here! Hmmm... how can I make these without the press I wonder? Not many hanging around in Washington DC Im sure. I love polvoron! I never knew they came from Spain! Great website!! Eatme_delicious- Yeah I was a little hesitant at first but it was good to give them go, finally. Peabody- No worries, glad that you like them. Sil BsAs- Yeah it's a nifty little gadget isn't it. Linda- Great, hope you enjoy them as much as I do!! Mobula- As you can probably see I added a little note at the beginning of the post. I am aware of polvoron's Spanish origins, however, you can see that this is the Filipino version as it is quite different to the Spanish ones. Zaya- Oh yeah guavas, I miss them too. I have seen guava jam here but never the actual fruit. They are a childhood favourite of mine too. Gkbloodsugar- Oh you must give it a try! It has taken me years to actually give it a go but it's so easy to make. Andrea- Thanks. See the note I added at the start of the post. Cecilia- Yes it does originate from Spain, you can check out the added note I wrote at the start of the post. Ginnie- I bought the press online although I cannot remember what the website was called so unfortunately I cannot refer it to you. Jenny- Yeah they are so addictive right? I could eat a whole pack if I really wanted to. Laura- Thanks you are too nice. Katie- If there is a Filipino food store near your area you could probably buy there. But if not I guess you just go ahead and make them. Manggy- We don't actually call it Japanese paper here in Oz, as most people associate that with gift-wrapping. We call it wax-paper or tissue paper. So that might be why it;s a little confusing. They are such addictive little morsels aren't they? Gretchen and Lyra- I am sure that if you really wanted to, you can make the powdered flour mixture and just eat it straight without the press. The press just makes it look pretty and wrap-able. Rachael- Thanks! As I mentioned before you don;t need the press to eat them. But if you are creative enough I'm sure you can make your own press. Good luck! Kat- That's funny, sometimes it's too long to wait for them to be presses. They are such a treat whichever shape they come in. Project Dualtech- Yes, they came to the Philippines as a result from colonisation. And luckily they did! OMG! I always wanted to make these since I was a little kid. Nowadays, I had to buy them imported. Thank you! 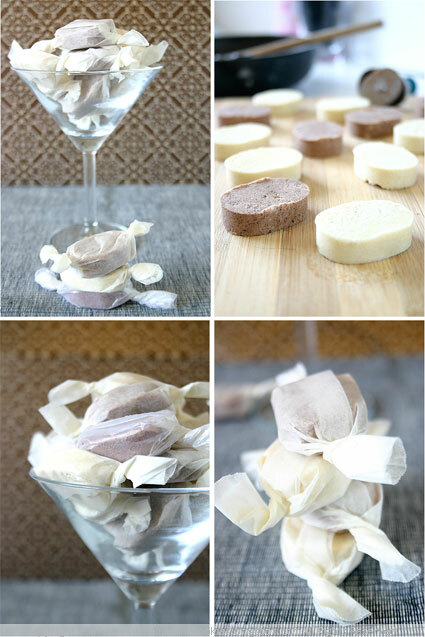 Congratulations for your blog, and the polvoron recipe. I´m ingnorant about this filipin way of sweet.